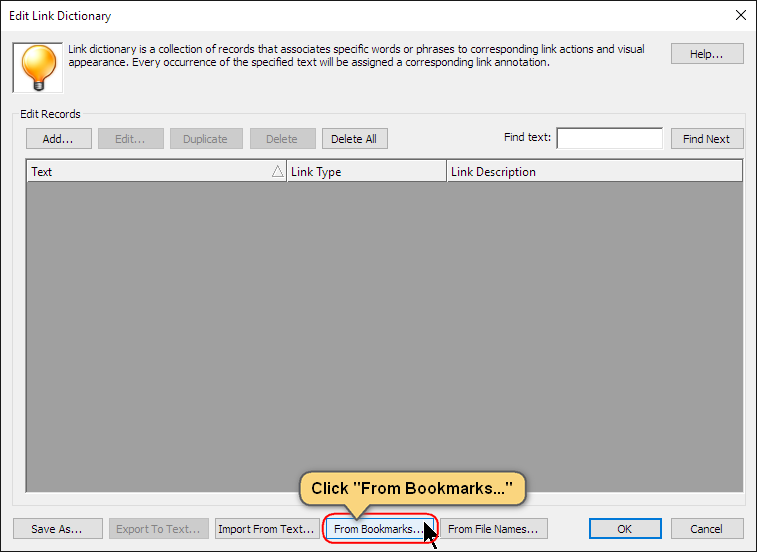 This tutorial shows how to automatically create links from bookmarks in a PDF document using the AutoBookmark™ plug-in for the Adobe® Acrobat®. Use this method to automatically add links to text that matches bookmark titles. Each link will use the same action as the corresponding bookmark. For example, if a document has a "Performance Overview" bookmark, then links will be added to all occurrences of the "Performance Overview" text in the document. This method is based on "Create Links from Dictionary" method. 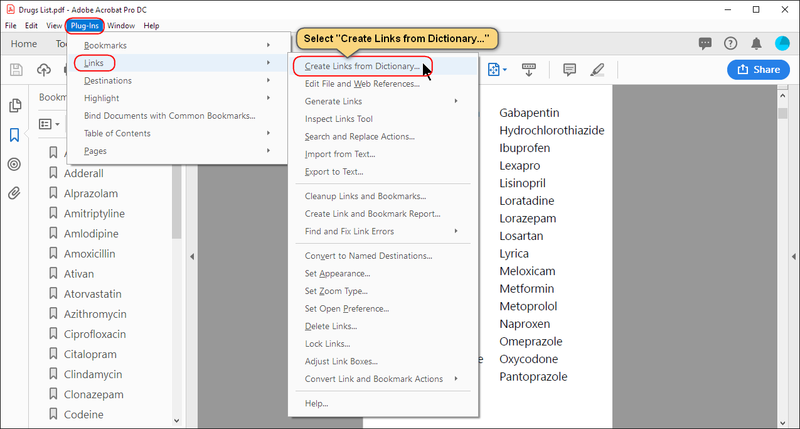 The link dictionary can be automatically generated from the document's bookmarks. 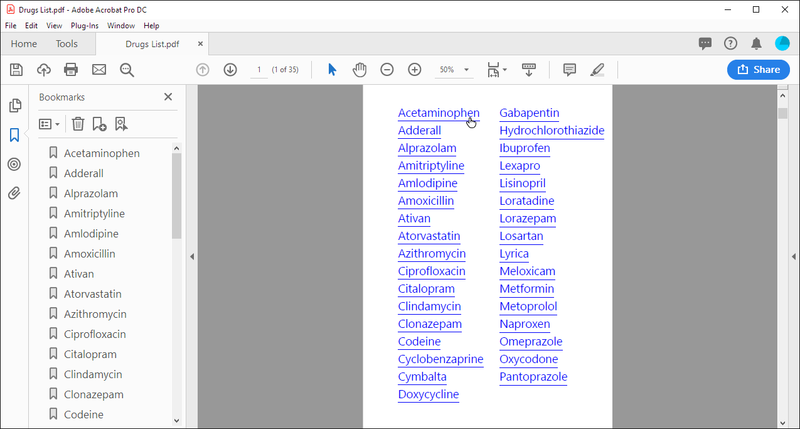 Bookmark titles are used as search terms, while corresponding bookmark actions are used as hyperlinks. The sample document used in this tutorial contains an index page with words that match the bookmark titles. The words need to be hyperlinked to the same locations as corresponding bookmarks. Start the Adobe® Acrobat® application and open a PDF document with existing bookmarks using "File > Open..." menu. Select "Plug-Ins > Links > Create Links From Dictionary..." in the main menu to open the "Create Links From Dictionary" dialog. 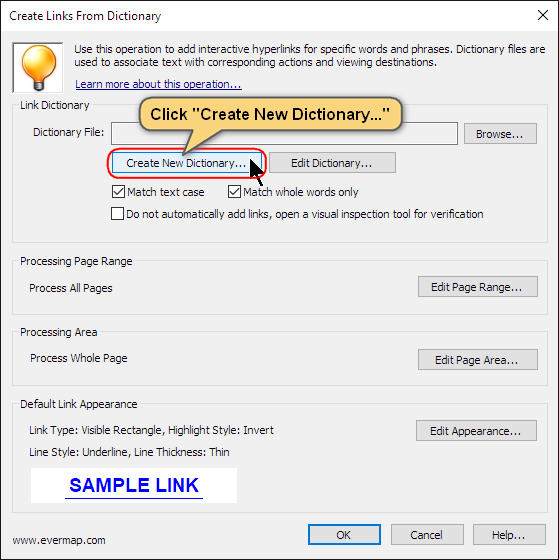 Click "Create New Dictionary..." in the "Create Links From Dictionary" dialog. The "Edit Link Dictionary" dialog will appear. 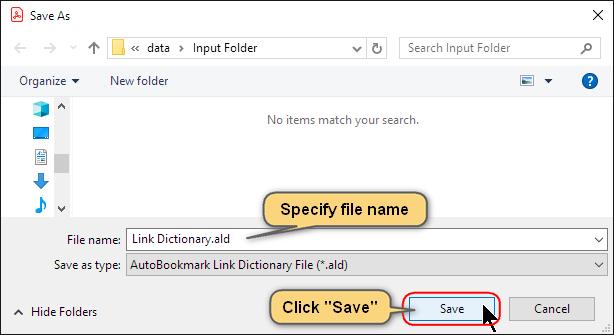 Search terms can be added to the dictionary manually, from bookmarks, from file names or imported from a comma-delimited text file (CSV file format). 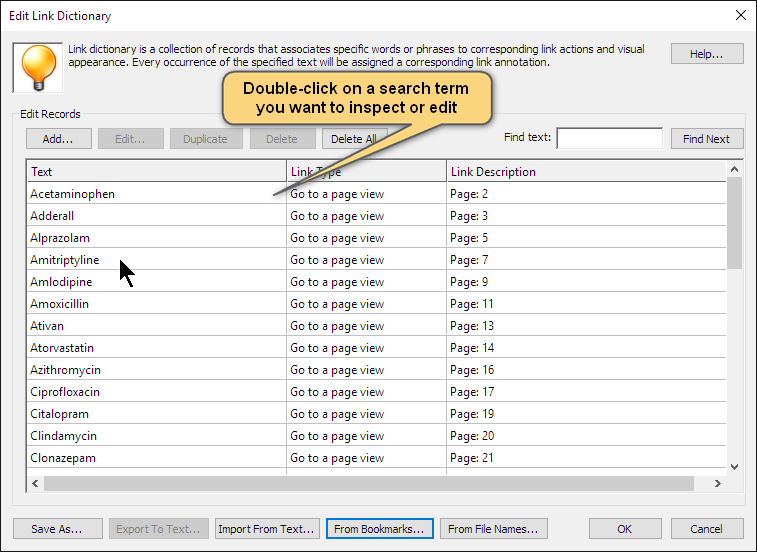 Click "From Bookmarks..." to generate new search terms based on bookmarks from a currently opened PDF document. The dialog will display the number of entries that have been created. Click "OK" to close it. Inspect the entries. Bookmark titles become a text to search for. Bookmark actions are used for the corresponding link actions. Only bookmarks with actions are used. Bookmarks without associated actions are not added to the link dictionary. Double-click on the search term to edit it (if necessary). In most cases, no editing is necessary. 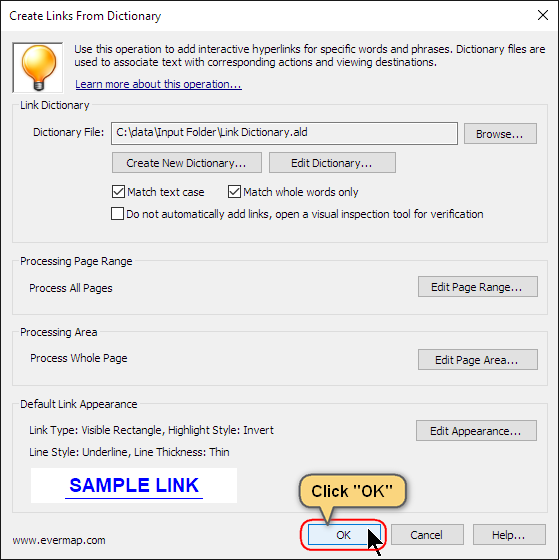 Click "OK" to close the "Edit Link Dictionary" dialog. You will be prompted to save the link dictionary to a file. Select an output folder and a file name. Click "Save". 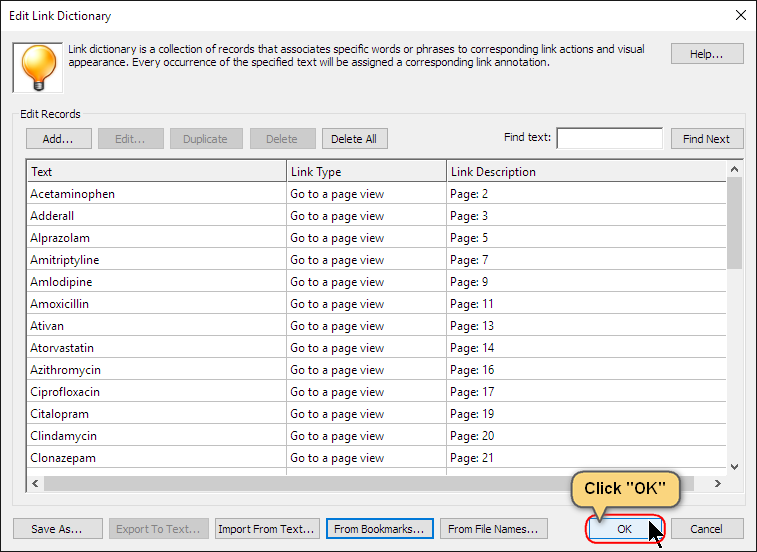 Specify text search options, such as "Match case" and "Match whole words only". If the "Match case" option is selected, then software performs a case sensitive search. Use the "Match whole words only" option to perform an exact text match. If the "Match whole words only" option is off then, all words that contain a search term will be matched. Optionally, check the "Do not automatically add links, open a visual inspection tool for verification" option to display the "Found Locations" dialog prior to automatically creating links. Use this dialog to inspect found text locations and add links only to selected text matches. Optionally, press "Edit Page Range..." button to limit processing page range to specific subset of pages. Use "Edit Page Area..." button to limit search area within the page. Click the "Edit Appearance..." button to select a desired visual appearance for the new links. The user has a full control over the visual appearance of link, including changing the color of the linked text. Press "OK" button to start generating links. The dialog will display the number of links that have been created. Click "OK" to close the dialog. The "Create Links from Dictionary" operation is also available as a command in the Action Wizard for performing batch processing. Click here for a list of all linking tutorials available.